The recipient loves deep colors and aboriginal art, particularly from Australia. 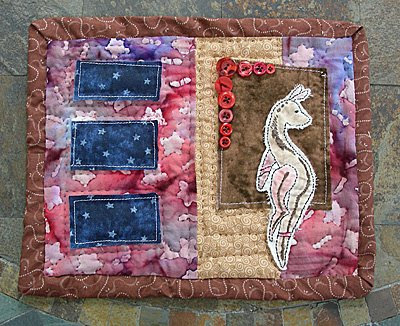 It is machine assembled, the kangaroo is hand embroidered and appliquéd (with a little wax colors added) and hand quilted, with traditional binding. I am loving making these little quilts. I would love to do a little hexagon quilt, a little cathedral windows one, and a few other ideas using the scraps in my stash. This is beautiful, You are very talented. I wish I know how to sew.